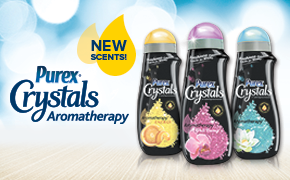 Purex Crystals Aromatherapy have three new and exciting in-wash scent boosters to breathe life into your clothes! As a Purex Insider, I was thrilled to be chosen to do a review of this new product. I received a free bottle of the Well Being scent to use in our laundry. The scent of fresh blossoms filled the laundry room and lasted for weeks on our clothes! The other two scents are Energy (with the energizing scent of citrus) and Serenity (with the calming scent of water lilies). Blended with aromatherapy essential oils, these floral and citrus scents penetrate through tough odors leaving our clothes with the most amazing scent. 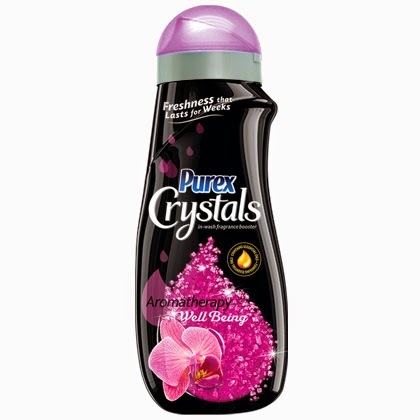 The pink crystals of Well Being Purex Crystals Aromatherapy are a great laundry enhancer and are so easy to add into my loads of dirty laundry. Even the tough odors of my husband's work clothes (he works for our local trash service) are no match against the happy fragrance of fresh blossoms in Well Being Crystals. Simply add a small amount of the Purex Crystals Aromatherapy at the beginning of your laundry cycle to eliminate laundry odors in your clothes too! Want to win a coupon for a free bottle of Purex Crystals Aromatherapy to try out for yourself? Simply enter my giveaway using the Rafflecopter widget below. *The Purex brand provided me with a bottle of Purex Crystals Aromatherapy in exchange for a product review. However, all opinions expressed here are my own.